Written by Intercollegiate Adventist GSA Coalition (IAGC) President, Jonathan Doram, during his Freshman year at Andrews University, these words reflect how difficult life can be if you’re an LGBT+ student on a Seventh-day Adventist campus. In addition to normal college stressors like handling classes and eating in the school cafeteria every day, you must navigate the fraught terrain of reconciling your faith, sexuality, and gender identity in sometimes very difficult environments (to put it mildly). To underscore this point, this week Campus Pride, a national non-profit dedicated to helping create safer college campuses for LGBT students, announced its updated Shame List which calls out the “shameful acts of religion-based prejudice.” Andrews University made the list, partly for its refusal to allow an official LGBT+ group on campus. Although there is AULL4One, an unofficial group that seeks to “create a safe and supportive space for LGBT+ students,” they are not allowed to meet on-campus or advertise to find others who may need help. At Andrews University, we are strongly committed to non-discrimination in the admission and enrollment of our students on the basis of gender, sexual orientation or religious beliefs. We recognize that LGBT students may be marginalized on faith-based campuses. As a result, in the past few years, we have actively worked alongside our LGBT student community to more fully realize our commitment to creating a harassment-free environment for all students. Andrews is proud of its LGBT students, and they have contributed in many important ways to the University’s faith and learning community. We will continue to invite their participation as the University seeks to create a campus culture that is reflective of the Seventh-day Adventist commitment to biblical faithfulness, which includes demonstrating care and compassion for all persons. As a product of these conversations, the school just released its most comprehensive-to-date Framework for Relating to Sexual Orientation Differences on the Campus of Andrews University. The framework came to fruition after a year-long process of conversations by two university taskforces. One of them, the Teen Homelessness Taskforce, sought to understand family risk factors for Adventist LGBT youth and local/regional needs. 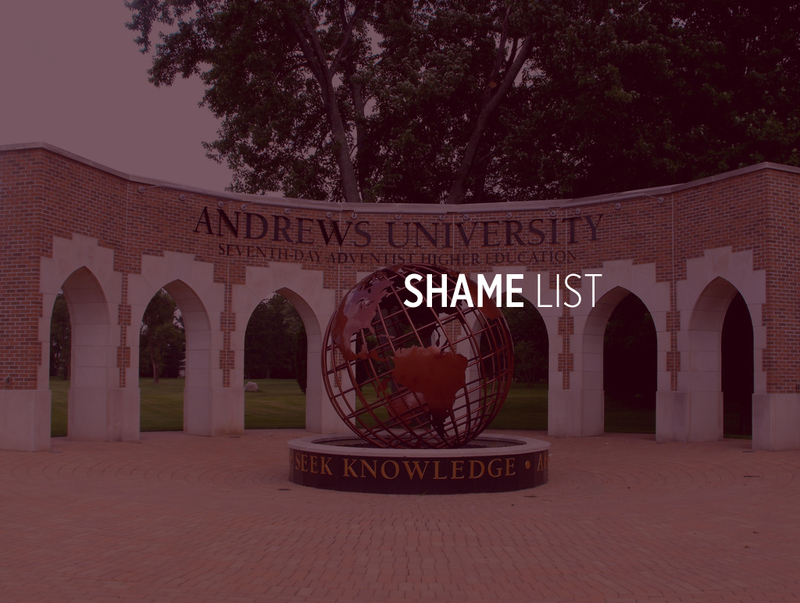 In light of these recent events, it’s helpful to ask, “How do LGBT+ students actually feel about life on Andrews’ campus?” Reactions to the Shame List and policy update have been mixed. While some note the important step Andrews has taken, there is worry over the policy caution against student advocacy in public settings. We have included a sampling of student responses below. The IAGC, a 501(c)(3) non-profit organization, is a group of student-leaders dedicated to creating safe spaces on their university campuses where open discussions can occur. To further its mission, the IAGC will be launching an October fundraiser campaign to help LGBT+ students. As we will be sharing news, students’ stories, and updates throughout the upcoming months, we invite you to follow us on our Faceboook page. Our goal is for every LGBT+ student coming to an Adventist campus to know that they are loved and they are not alone. We want these immensely valued students to know there are countless individuals who are taking a stand for their voices to be heard. If you have any questions or would like to personally reach out to the IAGC, please contact our President, Jonathan Doram, at iagc.sda@gmail.com or our Director of Marketing & Public Relations, Jefferson Clark, at iagc.southern@gmail.com. 1. A smaller sub-committee has been appointed within the larger taskforce with a specific assignment to continue to consider the University’s response to transgender students, as this group works in tandem with the developing position of the denomination on this issue. 2. The Adventist Church’s official position on homosexuality can be found here.